Scientists from Harvard University say they’ve ended an 80-year quest by compressing hydrogen into a potentially superconducting metal. Using a diamond-tipped anvil, the team squeezed a hydrogen gas sample to 71 million PSI, more than the pressure at the Earth’s core. 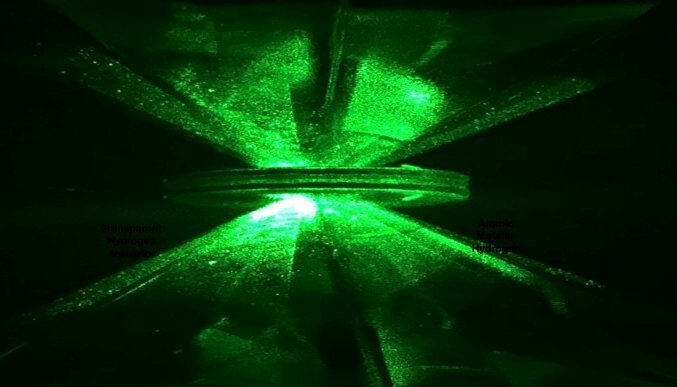 “It’s the first-ever sample of metallic hydrogen on Earth, so … you’re looking at something that’s never existed before,” says research lead Isaac Silvera. However, other scientists have reservations, saying it’s possible the solid material they created (pictured above) is actually aluminum oxide that came from the anvil’s diamond tips. It has long been thought that hydrogen could be compressed into a metallic form, where it could conduct electricity and possibly act as a superconductor. What’s more, it may remain “metastable” as a solid, even when cooled to room temperatures and pressures. If so, it could act as a superconductor without being chilled or compressed, resulting in cheap energy and new types of transportation. Hydrogen can be cryogenically frozen into a liquid, and by ramping up the pressure, transformed into a non-metallic, non-conductive solid. In 1935, Princeton physicists Eugene Wigner and Hillard Bell Huntington predicted that with enough pressure, solid hydrogen would become metal and conduct current. However, at higher pressures, hydrogen is forced into defects on a diamond’s surface, causing it to crack. What’s more, lasers used to measure the pressure and confirm the presence of a metal can cause excessive heating, further stressing the diamonds. To overcome those issues, the Harvard team fitted their diamond anvil into a cryostat cooled to just above absolute zero. They also perfect a new diamond-polishing technique that would eliminate surface irregularities. That enabled them to crank the vice up to 495 billion pascals (71 million PSI), the highest pressure achieved so far. By shining a low-powered laser that wouldn’t harm the diamonds, they detected a change in the hydrogen’s reflectance. “Then suddenly, it becomes a lustry, reflective sample, which you can only believe is a metal,” Silvera says. However, Silvera’s team only had one cryostat available, and wanted to avoid doing more tests for fear of breaking their specimen. “Now that that paper has been accepted, we’re going to do further experiments,” he said. Despite the skepticism, the team is confident of the findings. “It’s a tremendous achievement, and even if it only exists in this diamond anvil cell at high pressure, it’s a very fundamental and transformative discovery,” Silvera said. Pending further testing, you might want to temper your own excitement, however.